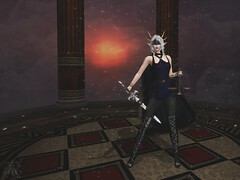 One thing I can tell you: I am no fan of complex puzzles, games that delight in making you lose (obviously gachas are an exception), So the truth is, I don’t do a lot of scavenger hunts.But when my friend (and I’m so honoured to call her that) Riven (yes, that Riven, of the whimsical and magical Rivendale), told me she had some items for the Twisted Hunt, and would I be interested in blogging them, I said, “Sure” without hesitation, because Riven‘s items are always wonderful to see and play with. Gwyneth also has some homes to get ready for the influx of people into Faerie. Gwyneth also has some homes to get ready for the influx of people into Faerie. This is one of those homes. It’s from the current round of The Arcade (mumble, mumble, gachas, mumble mumble, see above), made by 22769, a lovely little Victorian number that she thought would look great out on the edge of town, not far from the Book Forest. Of course, Faeries are attracted to beauty, whether it be dark or light. Of course, Faeries are attracted to beauty, whether it be dark or light. So there had to be a few accents to make the place attractive from the outside, before anyone ever passed the threshold. That’s where these rose trellises come in! That’s where these rose trellises come in! Riven did such a lovely job with them, and the wood textures on them matched so well with the wood accents on the house that I knew at once where I wanted to put them. And, as the Fae world moves into Autumn, splashes of colour become more and more important. It’s one reason why I chose these !go! boots from a past Fantasy Gacha Carnival for Gwneth; their green makes her happy against an otherwise quiet ensemble, colour-wise, for her. It’s also why I chose this lush hair from the talented mind of Truth Hawks (Natalie, currently at Uber), so that she’d have a little bit of summertime lingering around her. The trellis set includes an arch, a wide trellis, and a narrow one. The trellis set includes an arch, a wide trellis, and a narrow one, and it’s all copy/mod, so you could put together a whole country garden based around this hunt prize. The narrow arches perfectly balance the wider side of the house. Of course, just grass and rose trellises were looking a little empty…. …so Gwyneth had Bran and Kern lug some of The Plastik’s Dragon Benches into the front garden. …so Gwyneth had Bran and Kern lug some of The Plastik‘s Dragon Benches into the front garden, as well. It makes this house look more like a home, somewhere any contemporary Faerie would want to put down their own roots in. All in all, the house exterior now looks so much more complete! All in all, the house exterior now looks so much more complete! Gwyneth can get on to more fascinating things and move about her day. But who can resist the pull of Fae Roses after dark? But who can resist the pull of Fae Roses after dark? It’s as if little Wisps come to float around them, giving the garden that special, magical glow that makes for the perfect home. And then of course there’s the beauty of the individual flower. And then of course, there’s the beauty of the individual flower. Worth contemplating, touching (but not plucking! ), losing oneself in. Ah, if only Gwyneth didn’t have so much more to do. I know she could contemplate these roses for hours if there weren’t so many things pulling her in so many directions. Oh, well. Some lucky Faerie will get to live in this house and enjoy these roses every single day. And that’s enough to call Gwyneth’s work here finished. Spiffy photos taken with the indispensible aid of my LumiPro. I’d never decorate gardens without it! *Remember the part where I said I wasn’t very good at hunts? Let’s just say my friend Syeira and I gave up on the Twisted Hunt after about 30 seconds. If you love hunts, you’ll love it! I took Dyisi down beneath the mystical portals of the Fairelands Junction. I took Dyisi down beneath the mystical portals of the Fairelands Junction for our special time together at the Great Faire. I wanted to show her how beautiful the memories of all the Fairelanders were when placed into a special cove. The air was alight with candles, and the roots of the trees went deep, down into the river, symbolising the depth of caring Fairelanders have for their loved ones who are suffering and memorialising those who have gone before. This year, I have not been as present at the Faire as I have in previous years. The boys are taking over most of the merchanting duties for me now, and I admit I’ve settled nicely in the Faerie Haven at White Owl Island. It feels good to sit back and let work be done by others. But I knew I’d have to visit the Faire at least once this year, to connect with my long-time friend Dyisi and to marvel at the way the Realms shine when they are chosen to be part of the Faire. I thought Dyisi would love this memorial spot, but instead she grew melancholy. “I guess I probably should,” she said, and she followed it up with some of those Greek terms of endearment she uses. I persist in thinking they are complimentary. She put her arm around me. “Oh, like your desperate love for Her Majesty isn’t creepy?” Dyisi allowed herself a little laugh. “No, no; I am a character from someone else’s imagination, and she is a very good friend to Gwen Enchanted. “I’m listening,” I said. And I held her. A few words from the mind behind the satyr..
First off, let me thank Gwen.. who has been an amazingly dear friend to me for years now.. for allowing me to say a few words. Her blog has been a great source of entertainment and touching stories that is more than just a labor of love. But an outlet for her beautiful and talented soul. So I thank her from the bottom of my heart to be apart of not just her stories, but her life. As well as her dear husband Joe, who also touched my life in a very remarkable way. He is missed deeply. There is also another woman who has been an influential part of my life, as well as having been my rock. My mother. She passed in June of 2013 after a short battle with lung cancer. Her diagnosis was in March of that same year. So we did not have a lot of time in the end, and even though I am told not to have regrets, I do. It’s hard not to, especially when her life ended so quickly. Things I wish I could have said, wishing I could have been there at her side when she finally passed. While I still hold to these regrets, I also look back at the life we lived. She was an amazing woman, strength in the face of all adversities.. Be it her time spent in the Marines during Vietnam, or the life our family lived. Her sense of humor never wavered and in that taught me to laugh when things feel hopeless. For that, I will forever be thankful. She also did her best to try and protect me from death, even though it’s inevitable. This does include her own death as she insisted I stay home… three thousand miles away. Despite my better judgement, I listened to her, because she is my mother..
Cancer is not new to my family, as it has claimed so many on my mother’s side. Her father passing from leukemia, while lung cancer claimed her mother, aunt, and a year after mom died, one of her sisters. Even my cousin’s little girl fought leukemia, which I can happily say she is in full remission. At the beginning of this year, a close childhood friend had lost her battle with cervical cancer. This monster is all too familiar to me, and so this is why Fantasy Faire has become important to me ever since I discovered it. I thank the creators and participants.. vendors and supporters.. for all that they do for the American Cancer Society. Helping those who work tirelessly to defeat this monster so that no one else.. no more of our loved ones and own selves.. will fall into it’s clutches. I’d never seen tears from Dyisi before, but now I did. And I confess I buried my face in her hair to staunch my own. I shall not tell you how we spent the rest of our night together. I shall not tell you how we spent the rest of our night together; I shall only say that the unlikely friendship between Gypsy and Satyr—and the unlikely friendship between American expat and Seattle dilettante—continues to be a force for good in the world. Let all your stories out. Let all your tears flow. Recognise that together, we are stronger than cancer, stronger than the losses we have sustained because of it, strong enough to go on. Those candles burn for every beloved person who has passed to the other side of the Veil, for every beloved person who wakes up to fight another day, for all of us who contribute, with our time and our money and the love in our hearts (which knows no end). Catalina Staheli’s “Why Do You Relay” photo of The Amazing Catwoman, from the 2015 Fantasy Faire. Catalina Staheli took this photograph of The Amazing Catwoman at the beginning of the 2015 Fantasy Faire, my (Gwen Enchanted’s) first year as a Fantasy Faire blogger as part of her “Why Do You Relay” series. That was the year my husband, Joe Raftery, was moved from curative to palliative care. My heart was on my sleeve then, and it is now, as well. Eight months after this photograph was taken, I became a widow. Fairelanders, one of my SL tribes, supported me through his illness. My roleplaying tribe, which includes Dyisi, whose beautiful words are above, were with me constantly. My real life family stayed by my side and have never left me. I am rich, rich in friends and rich in family. I am also rich in memories. Why do I relay? I relay because, at fifty-one years of age, I am still too young to be a widow. Location: Fairelands Junction, Sponsored by Ruins of Xenark Roleplay Community and designed by Saiyge Lotus. Spiffy photos taken with the indispensible aid of my LumiPro. I’d never blog Fantasy Faire without it!